The facilities at George Mason University are fantastic. 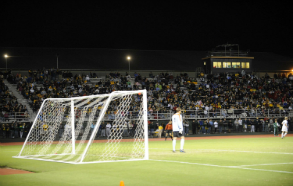 We will use the state of the art Stadium and bermuda practice fields that are used by the soccer teams at George Mason. These facilities have hosted numerous professional, International and club teams from around the world. These include, the US National teams, Men and Womens, as well as Germany, Paraguay, El Salvador and Jamaica are a snap shot of the National Teams who have trained on our facility. Major League Soccer teams who are in town preparing to play DC United, often train at George Mason. In addition, to the incredible outdoor facilities, we have the good fortune of being able to use the Fieldhouse in the event of severe weather.